1. U-Pb age of the achondrite Asuka 881394 – the oldest known igneous rock in the Solar System. 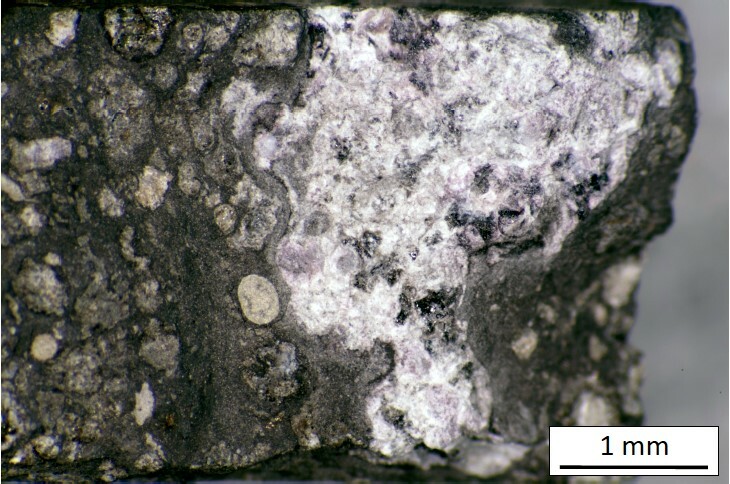 Asuka 881394 is a unique basaltic achondrite composed of mostly calcic plagioclase and pyroxene. It shares many similarities to coarse-grained cumulate eucrites, but the differences isotope systematics indicate Asuka 881394 was formed not on asteroid Vesta like eucrites, but on another asteroid. The Pb-Pb age for Asuka 881394 of 4566.51±0.21 Ma, reported by Wadhwa et al. (2009), makes it the oldest known igneous rock in the Solar System. However the age difference between Asuka 881394 and the angrite D’Orbigny – the best current reference rock for Solar System chronometry - is inconsistent between Pb-Pb, 26Al-26Mg and 53Mn-53Cr chronometric systems. 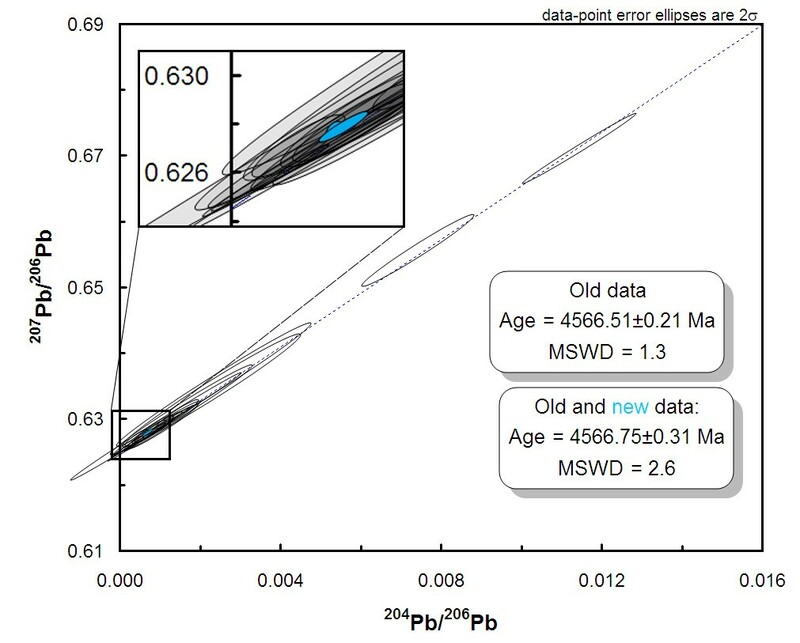 We re-investigated the U-Pb systematics of Asuka 881394 using multi-step partial dissolution with high precision isotopic mass spectrometry in order to better understand this age discrepancy. The new age of 4565.57±0.55 Ma is obtained by combining new, more precise, data points, with the original data set, and applying a directly measured uranium isotopic composition 238U/235U= 137.768±0.038. We found that the new age does not eliminate the discrepancy between various chronometers, but, rather, slightly increases it. This result suggests that the age discrepancies are likely to be caused by natural factors such as heterogeneous distribution of 26Al and 53Mn, rather than by uncertainty of isotopic dating. 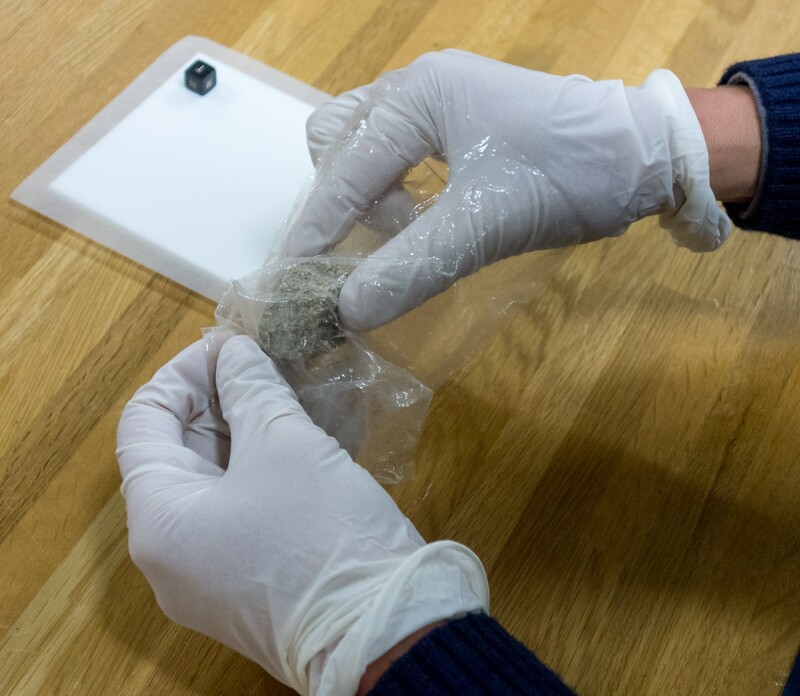 Akira Yamaguchi, the curator of meteorite collection at the National Institute of Polar Research in Japan, handles the main mass of Asuka 881364. It is a small meteorite – 70 grams only, and has no known pairs. Pb isotope data for all pyroxene and bulk rock residue fractions. Grey ellipses – fractions from Wadhwa et al. (2009) . Blue ellipses – this study. Full story in 46th Lunar and Planetary Science Conference (2015) , abstract #1842. Among the calcium-aluminium-rich inclusions (CAIs) that are considered the first macroscopic solids that formed in the Solar System there is a small subset referred to as FUN CAIs (an acronym for Fractionation and Unidentified Nuclear effects) that exhibit unusually large mass-dependent fractionations and mass-independent isotopic variations in many elements. Understanding the origin, conditions of formation, genetic relationship of these inclusions with other CAIs and the time of formation has been hampered by the rarity of these objects: since the first discovery of two FUN CAIs 37 years ago, only about 20 such CAIs have been identified. Variable and low compared to “normal” CAIs 26Al/27Al ratios in FUN CAIs derived from their internal 26Al-26Mg isochrons suggests that these CAIs formed either prior to, or simultaneously with, injection and homogenization of freshly synthesized 26Al into the protosolar nebula. Alternatively, the FUN CAIs could have formed significantly later, or experienced widespread resetting of the 26Al-26Mg isotopic system, but then the widespread isotopic anomalies are hard to explain. We have studied U-Th-Pb and Rb-Sr isotopic systematics of a FUN CAI CMS-1, recently discovered in the Allende meteorite by researchers from the Arizona State University. The most intriguing observation is the evidence for extreme elemental fractionation between REE and Th, on one hand, and U, on the other. Considering “flat” distribution pattern of rare earth elements, this fractionation is unlikely to be caused by evaporation and/or condensation processes and the difference in volatility. Nucleosynthetic origin of low U abundance is also unlikely, since U and Th are thought to be produced in the same r-process, and the ratio of their yields have little dependence on the conditions, e.g. neutron flux. In terrestrial surface environments, U is known to very efficiently fractionate from REE, Th and other elements by leaching under high oxygen fugacity. Similar interaction with an aqueous fluid in the nebular environment, either in the protosolar nebula or near the place of primary condensation, could have caused U removal from the parent material of the FUN CAIs. Although the reason for the measured depletion in U is not clear at present, it is noted that the ~5 mg fraction of CMS-1 analysed thus far may not be representative of the bulk inclusion. Further analyses will be required to address this issue.